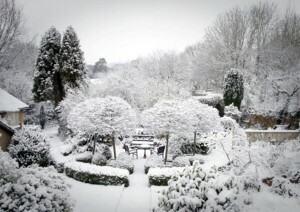 Nobody wants to think of gardening at this time year, we get that as neither do we! But it can in fact be the best time to get those odd jobs done we keep putting off in the busy summer, while at the same time lay the groundwork for next year’s projects when Spring finally rolls around. 1. While your plants and shrubs grow to a halt for winter, n ow is the time to trim and cut them down to the size and shape you want them. 2. Remove your annual plants that you know won’t survive the winter and would otherwise just rot. 3. Use the waste & cuttings to start a compost heap, ready for use in the Spring. 4. Use the autumnal mulch and cover the soil and plants you want to save for next year, the moisture conserved in the plants will help protect the roots through the cold. 5. Removing the leaves and mulch isn’t just about cleanliness, leaving it can help promote the spread of certain fungi. 6. Rodents and other nasties can be attracted to your garden as well to use the debris as nesting areas during winter, so don’t leave it in a pile at the bottom of the garden. 7. Lastly, don’t worry about the lawn, trying to mow or reseed the lawn in the winter months can do more damage than good in the long term. A few quick tips, if you’re not particularly green fingers it can sound like a drag, but it’s less overall work when Spring Cleaning season comes around. Act now or regret later!